Be the first to share your favorite memory, photo or story of Rosalia. This memorial page is dedicated for family, friends and future generations to celebrate the life of their loved one. Mrs. Rosalia Bach, formerly of Port Washington, passed away Monday morning, October 17, 2016, at Gables On the Pond in Random Lake, where she had resided for the last 18 months. She was 94 years old. Rosalia was born in the Town of Saukville on July 1, 1922, daughter of Dominic and ​Genovefa Endstrasser Stadler. On April 27, 1946, she married Arnold Bach at Holy Cross Catholic Church in the Town of Belgium. He preceded her in death in 1983. 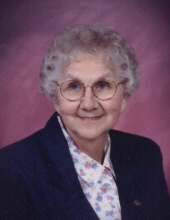 Rosie was a member of St. John XXIII – St. Peter of Alcantara Catholic Church, in Port Washington, Port Washington Senior Center, and a longtime member of the VFW Post 5373 Auxiliary. She was also a past member of St. Nicholas Catholic Church and Holy Cross Catholic Church. Rosie had worked at Appleland and Allen Edmonds, and volunteered as a poll worker, at the Pebble House, with 4H and with the Special Olympics. She liked singing, and had sung in the Holy Cross, St. Nicholas, St. Peter’s and the Port Washington Senior Center choirs. Rosie loved shooting pool, bowling, playing cards (especially sheepshead), and dominating at Scrabble. Rosalia is survived by two sons: Andrew (Nita) Bach of Sarasota, FL and Donald Bach of Sheboygan, and six daughters: Mary Anne (Francis) Schimberg of Fredonia, Maddie (Marvin) Goetter of Waukesha, Lorraine (Rob) Urfer of Hayward, CA, Lucy (Charlie) Tennies of Westminster, CO, Dolly (Dennis) Prom of Saukville, and Carrie (Rick) Kappel of Menomonee Falls. She is further survived by 20 grandchildren, 33 great-grandchildren, 4 great-great-grandchildren and sister-in-law Vicky Stadler of Calimesa, CA, as well as numerous nieces, nephews, other relatives and friends. Mrs. Bach is preceded in death by her husband Arnold, 5 brothers: Joe, Alois, Frank, John and Alfons and 5 sisters: Anna Riebniger, Johanna Lesch, Bertha, Loretta Klus and Mary Lafnitzegger. Mass of Christian Burial will be held at 5:00 pm on Thursday, November 3rd, at St. John XXIII – St. Peter of Alcantara Church, 1800 N. Wisconsin St., Port Washington. Father Patrick Wendt will preside. She will be entombed beside her husband the next day at St. Mary’s Mausoleum, Port Washington. The family will receive visitors at the CHURCH on Thursday, Nov. 3rd from 3-5pm. Memorials are suggested to Gables On the Pond if desired. The Eernisse Funeral Home in Port Washington is assisting the family with arrangements. Online condolences may be left at www.eernissefuneralhome.com. The family wishes to express a special thank you to Gables for the great care of Rosie for the time she was there. To send flowers or a remembrance gift to the family of Rosalia "Rosie" Bach, please visit our Tribute Store. "Email Address" would like to share the life celebration of Rosalia "Rosie" Bach. Click on the "link" to go to share a favorite memory or leave a condolence message for the family.